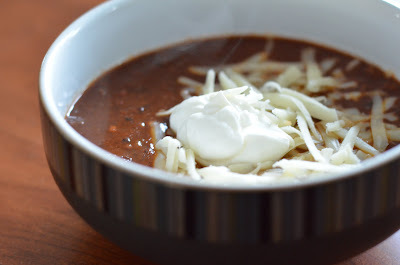 Time to get this soup recipe up before the soup weather is totally gone! I love good homemade soup, but I find soup to typically be one of those things that wildly varies from very good to very bad. 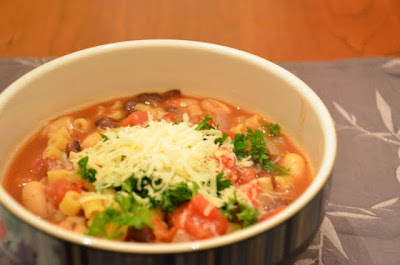 I also don’t yet have the experience to really play around with ratios on my own when coming up with a scratch soup, but with this pasta fagioli recipe I know have one less soup I need to find a recipe for! Excellent. Heat oil in a large Dutch oven over medium-high heat until shimmering but not smoking, about 2 minutes. Add the pancetta and cook, stirring occasionally, until it’s beginning to brown, 3 to 5 minutes. Add the onion and celery; cook, stirring occasionally, until the vegetables are softened, 5 to 7 minutes. Add the garlic, oregano, red pepper flakes and anchovies; cook, stirring constantly, until fragrant, about 1 minute. Add the tomatoes, scraping up any browned bits from bottom of the pan. Add the cheese rind and beans; bring to a boil, then reduce the heat to low and simmer to blend the flavors, 10 minutes. Add chicken broth, water and 1 teaspoon salt. Increase the heat to high, and bring to a boil. Add the pasta and cook until tender, about 10 minutes (refer to package instructions to better estimate pasta cooking time). Discard the cheese rind. Off the heat, stir in 3 tablespoons of the parsley; adjust the seasoning with salt and pepper. Drizzle each individual serving with olive oil and sprinkle with a portion of the remaining parsley and more Parmesan cheese. I don’t like tomatoes, but I’ve developed a strange love for tomato bisque type soups. Strange girl, but apparently cream does make everything taste better. 😉 Honestly, I couldn’t decide what my opinion was on the fire roasted tomato flavor. I think I still prefer it non-fire roasted, but I had no trouble finishing while watching House Hunters International in some random countryside! In a large saucepan, heat olive oil and butter over medium heat. Once butter has melted, add onions and garlic, cook until onion is softened about 5 minutes. Pour in wine and allow to cook for 1 minute. Add in crushed tomatoes, vegetable broth and granulated sugar. Season to taste with salt and pepper. Bring to a boil. Reduce heat to low. Stir in 2 tablespoons of soup into half and half to temper it. Slowly stir tempered half and half into soup and allow to simmer for 30 minutes. At this point, if you would like a smoother soup, use your immersion blender and process until smooth. Or blend in batches in a regular blender. Sprinkle with fresh basil and serve hot. I’m not sure where my mom originally got this recipe, but it’s such an easy soup to throw together when the cold weather strikes (especially with the canned soup shortcut)! YUM! **Update – My mom said it came from the back of a Campbell’s Bean and Bacon Soup can in 1978. How does she remember years like that??? In large saucepan, brown the bacon. When almost browned to your desired stage of bacon “doneness”, add the onion, celery, and garlic. Saute until tender. Add basil, soup, broth, water, tomatoes, pasta and salt. Bring to boil and then cover. Reduce heat to simmer for 15 minutes. Add cabbage and zucchini, and simmer for an additional 10 minutes. Stir occasionally. Taking an attractive picture of most soups is challenging, and this surely fits into the unattractive soup picture category. However, this really was quite good, and I definitely will be keeping the recipe. The fresh herbs are crucial to this soup in my opinion; it would be kind of bland without it, so I wouldn’t substiute them out for dried or omit them. Also, a drizzle of good quality olive oil at the end added a really wonderful flavor. Heat 1 tablespoon olive oil and butter in a heavy large saucepan over medium heat. Add the onion, pancetta, and garlic and saute until the onion is tender, about 3 minutes. Add the broth, beans, and sachet of herbs. Cover and bring to a boil over high heat, then decrease the heat to medium and simmer until the vegetables are very tender, about 10 minutes. Discard the sachet. Puree 1 cup of the bean mixture in a blender (or use an immersion blender) until smooth*. Before putting the puree back into the soup, add the macaroni and boil with the lid on until it is tender but still firm to the bite, about 8 minutes. Return the puree to the remaining soup in the saucepan and stir well. Season the soup with ground black pepper and red pepper flakes. Although I think I make this a bit thicker next time, there will be a next time. Very tasty on a cold day!